…and now I’m visiting Dianne Hartsock’s blog. Drop on by! I’m sharing some thoughts about what makes good horror – specifically, that less graphic detail is actually better. Pop on over to Gary Peterson’s blog, where I’m talking about what influenced me to write The Tunnelers, and how I put the story together. After a hiatus that was longer than anticipated, I am back – but I’m not alone! Allow me to introduce to you Gary Peterson, a fellow author at Solstice Publishing with a number of titles to his name. Today, I’d like to share my thoughts about a recent short piece of his entitled, Return to Painter’s Island. I must admit to having something of a fascination for the United States of the 1950s. It’s not the aesthetics so much (except for the cars, which I love); it’s the fact that, for the first time in history, we had a society that was aggressively (and often naïvely, in my view) optimistic where scientific progress is concerned. This is the period where science fiction bloomed as a literary genre, and the notion of reaching the stars was something supported by wide sections of society – not just crackpots and visionaries. It was a time when a lot of people honestly believed that, no matter how bad a problem seemed to be, someone would invent a device or chemical compound to solve it. To me, the society of that time seems almost innocent, when I consider the challenges we are facing today (some of which had their roots in the ’50s). But this optimism, of course, masks a darker side. The 1950s also brought us McCarthyism and the Cold War; they gave us, through television, a taste of the commercialism that was to come; and, through the emerging social consciousness that would explode in the 1960s, they highlighted how resistant North American culture had become to new ideas. 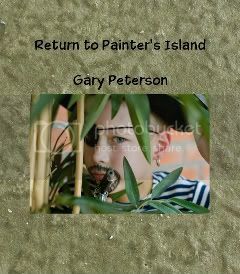 Return to Painter’s Island is set in this cultural milieu, but we are seeing it from the narrator’s perspective looking back to when he was nine years old. Jim is your typical American boy, growing up in eastern Washington State with two occasionally annoying younger sisters (Cathy and Maggie). We are shown very quickly that not all is well with his family. His father is ill from radiation treatments to remove a tumour, and is unable to work. To make ends meet, Jim and his mother work odd jobs at apple orchards. It is backbreaking work, and, combined with the pressure he places upon himself to be strong, Jim is unable to truly live life as a child. Despite these difficulties, Jim still has a child’s optimism. He sees his mother, worn out from work and worry, as someone who can do just about anything, and he shares his father’s hope for a full recovery – and a return to better times. To get away from his daily troubles, Jim escapes to “Painter’s Island”, a 40-acre vacant lot separated from his house by a stream. There, he is able to live like a normal child – if only for a few hours at a time. He and his sisters pretend to be pirates, dig for buried treasure, build forts, and leap off of sawdust piles. Their only real toys are their imaginations, which they use to turn the rich landscape into any world they wish. In them, we see kids being kids, and their ability to take pleasure in such simple things is a strength. Return to Painter’s Island is a nostalgia trip, to be sure, but given Jim’s background, and the fact that the narrator’s view of this time in his life is rose-tinted, it works. I would have liked to see more of Painter’s Island through Jim’s eyes, and to read more about the trouble he no doubt stirred up with his friends, but the part I did see showed me a place full of warm, sustaining memories. I enjoyed reading it, and that, I suppose, is enough. Gary Peterson lives near the small community of Yakima, Washington with his wife and dog. He has a B. A. Degree in Business Administration and a Master’s Degree in Counseling Psychology. His hobbies include hiking, bowling, and reading a good mystery novel. Gary has written a number of other works, including an excellent mystery novel entitled, The Old Miller Place (please see my Amazon review), and The Kidnapping of Olivia Hammond.